When I love a book (or an author) I will do everything shy of standing on a busy street corner wearing a sandwich board advertisement for them. I post reviews everywhere, I buy extra copies for friends and loved ones, I plug the author/book on Facebook, Twitter, and my blog, I go to signings and I have even found ways to creatively hand-sell books at the bookstore if I end up in a conversation with someone. And, yes, I make a point of letting the author know specific ways the book moved me. It was great meeting you in Salem, and my signed copy of The Art of Falling is proudly displayed! Aw thanks about “proudly displaying” my book Kim—that cover is artwork, to be sure! And sandwich board display—I forgot that one in my post, lol! I too have handhold favorite books. I’m responsible for at least a dozen of the gazillion sales of Ann Patchett’s Bel Canto, and that was before I gave away 20 copies on the streets of Doylestown on World Book Night. Thanks for your comment! What a wonderful post about your adventures with your debut novel, Kathryn, and now leading up to the highly anticipated THE FAR END OF HAPPY! 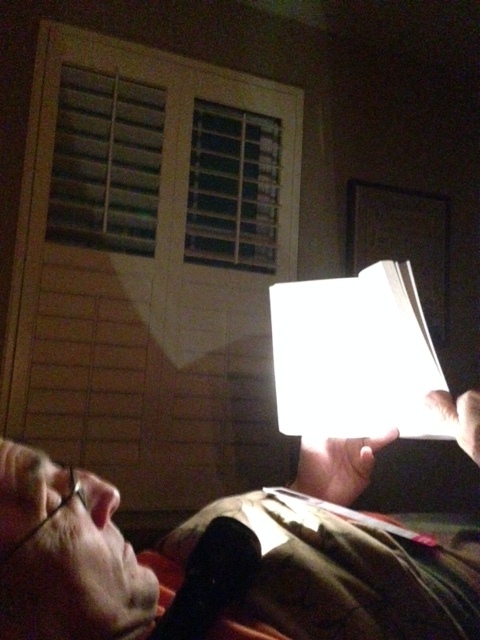 I especially love the photo of Dave reading by flashlight. Yes I love that too—the very picture of dedication! Thanks for reading Donna! You have also been a wonderful advocate, my friend.